Mount Zion Pentecostal Church 1975-2005? Methodism was always a stronger tradition in Norfolk than in Suffolk, and this was as true as anywhere in the working class suburbs of north and west Norwich. The status which the Methodist movement had in the local community might be judged by the two stones set either side of the entrance of this attractive building. One is a foundation stone, the other a memorial, and they remember Thomas Jarrold and JJ Colman respectively. Both Jarrold's and Colman's are still names widely associated with Norwich, and are still two major local employers. 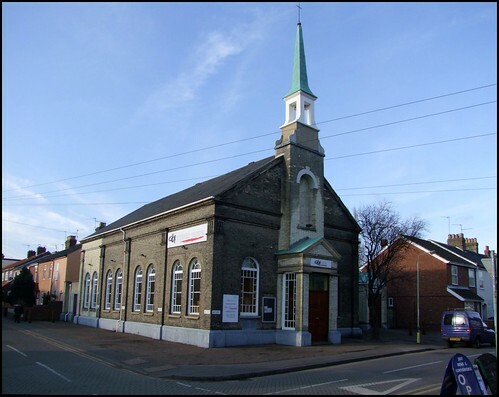 The Heigham Methodist Church was built in 1878, at a time when this was a busy area of mill and shoe workers. Many of their terraces survive, albeit gentrified, as do corner shops and pubs, despite the terrible toll that the Norwich Blitz took on this part of the city, particularly the night of 24th April 1942, when more than 150 people were killed in the adjoining streets. That first night of the so called Baedeker Raids completely destroyed the medieval parish church of Heigham, St Bartholomew, which stood a couple of hundred metres to the north-west. The tower there is now a ruin in a public park; but in the 1950s, by which time the Methodist community here had moved on or died out, the Anglicans came here, and for about twenty years this building was the unlikely Church of England Parish Church for the suburb of Heigham. During this time, it was restyled St Bartholomew in memory of its medieval predecessor. The Anglicans remained here until 1975, when they moved in with St Barnabas. After that, this became the home venue for the excitingly named Mount Zion Pentecostal Church. To be honest, that was how I expected to find it today. I was cycling up Nelson Street having been suitably refreshed at the Fat Cat, and it was only as I got off my bike outside the elegant portico and spire that I noticed it was now rebadged as City Church. This appears to be an independent denomination with a couple of churches in Norfolk, and which was previously based in Cowgate. Beyond that, there's not much I can tell you: the City Church website is under construction at present, and there is no word from the Anglicans other than that St Barnabas is now 'St Barnabas with St Bartholomew'. However, City Church is the name used by several UK outlets of the American protestant evangelical franchise church New Frontiers International, including their church in Cambridge, so it may well be that this is the case here. I am sure that someone will write and tell me. Meanwhile, this pretty building is an adornment to the terraces of Nelson Street.